Despite being to close to polling day, there are many Malaysians abroad who are still trying to get their votes back to their respective constituencies. To help out, many Malaysians overseas are connecting over Facebook to link late postal voters with willing volunteers to help ferry back their ballot papers. With May 9 under 24 hours away, all Malaysian eyes are now focused fully on GE14 and the day of polling that will determine the future of our nation for the next five years at least. For Malaysians voters overseas (there are an estimated 200,000 of them), the scramble to get their votes back in time to be counted has reached fever pitch, with things exacerbated by the delays in overseas voters receiving their ballot papers—some dangerously close to the polling date, and unfortunately for a smaller few, not at all. 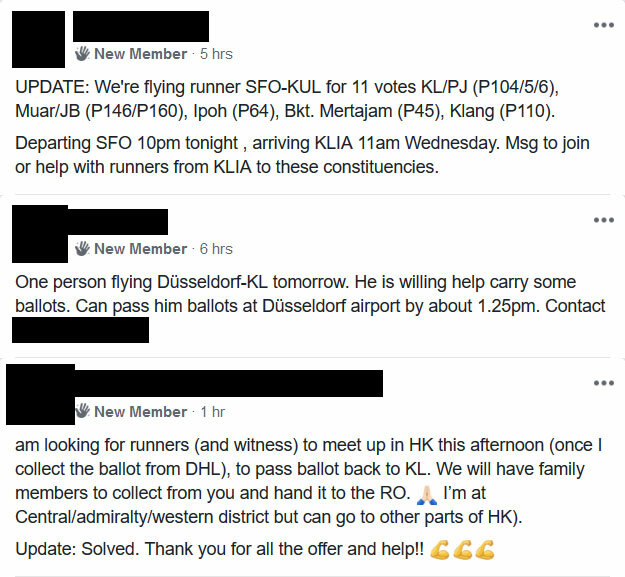 In a show of civic-mindedness and aiming to help those trying to get their ballots back in time to be counted, Malaysians all around the world are using social media to connect postal voters still yet to get their ballots back to Malaysia with willing individuals who want to provide some last-minute help. For the most part—these individuals are collecting ballot papers from other postal voters and are promising to help ferry them back to Malaysia, where postal voters can coordinate with their friends and family to have their ballots collected by hand from these good Samaritans. Note: Based on information circulating on relevant Facebook groups, overseas postal voters will need to have their ballot papers witnessed, signed, and delivered to their Returning Officer (RO) by May 9, 5PM in order for their votes to be counted. For a full list of ROs and their contact information, have a look at this list. For a full guide to postal voting, check out this link. For those still desperately trying to get their votes back in time, this is a good option to consider, and despite it being extremely late in the overall timeline, there might still be some offering to help out. Here are some of the online communities you can look to for help. 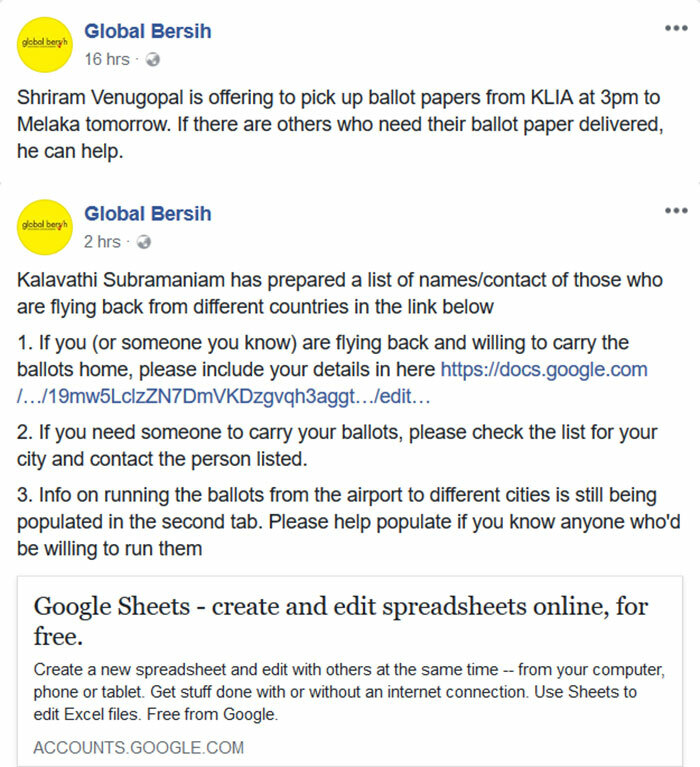 The Global Bersih page on Facebook is the international advocacy arm of Bersih 2.0 and is currently doing their best to help overseas Malaysians get their ballot papers submitted to their respective Returning Offices (RO) in time. The Global Bersih page on Facebook features occasional updates that might prove helpful if you’re a last-minute postal voter. Malaysians anywhere in the world looking for last-minute postal voting help should pay close attention to the Global Bersih page, as they are actively sourcing and sharing updates that could potentially help them find a last-ditch solution. 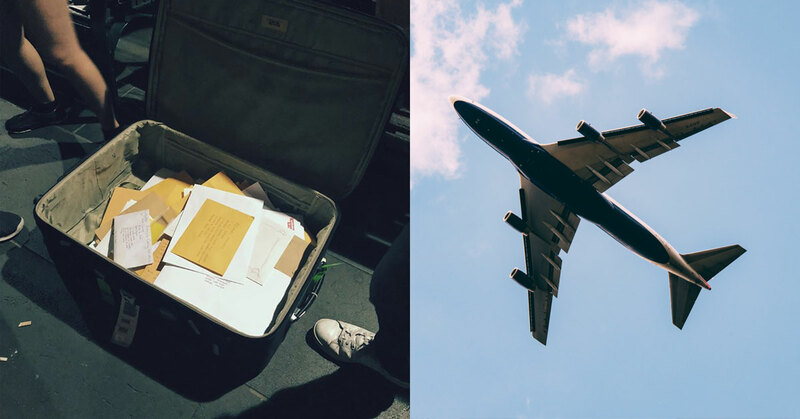 This group on Facebook focuses purely on postal voting for GE14 and is also currently trying to match Malaysians living abroad with other Malaysians who are traveling home before May 9th. If you still haven’t found a way to get your vote back to your Returning Office, this group has plenty of international volunteers offering their help out—be it with helping you witness your ballot paper, or actually helping you courier your vote back to Malaysia. This group specifically made for Malaysians in the UK and Ireland is also another meeting ground for overseas postal voters to request and offer help. If you’re based in this region, best to head over to this group first. While it’s true that we have our differences from time to time, it’s always encouraging to see that as Malaysians, we can always depend on each other to put them aside and come together for more noble purposes. Hopefully, we will continue to build upon this spirit of togetherness even after the polls are concluded, no matter what the outcome. We wish all voting tomorrow a safe GE14! If you’re a first-time voter, check out our previous articles on tips for new voters here.